…& the teacher introduces the student. Alain Badiou tell us about the pursuits of a young philosopher as seeking to heal a wound & to ask himself “…what thorn was I seeking to draw from the flesh of existence when I became what is called ‘a philosopher?’” (AF vi) Quentin Meillassoux has found this question, the thorn is imbedded in his book: After Finitude. Meillassoux seeks to retrieve such a thing in itself from the jaws of continental philosophy after Kant, Husserl, Heidegger &c., including the logical analytics of Wittgenstein. The way this is done suggests the obvious choice of regressing into a metaphysical way of solving the problem. Metaphysics might permit such an extravagance to take root under a placement of dogmatic assertions. But Meillassoux is a skeptic & so he makes few concessions for the metaphysical, except to expertly slice out the absolute, & on this we’ll look to later (in another post). Meillassoux is keen to account for what Kant’s objectives were, that is, to extract subjectivity from its metaphysical baggage, this complexity doesn’t permit Meillassoux to retreat to a dogmatic solution. Aside from that, we are still reliant on inter-subjectivity. “Scientific truth is no longer what conforms to an in itself, supposedly indifferent to the way in which it is given to the subject, but rather what is susceptible of being given as shared by a scientific community.” (AF 5) We are challenged to see that science appears more apt to bear witness to such a thing in itself sooner than philosophy might. Science is where the in itself is announced & possibly where we’ll find clearer passage to it, sooner than we might with philosophy after Kant—until now. This leads us to name Meillassoux’s key term “correlationalism’ as he defines it: “By correlation we mean the idea according to which we only ever have access to the correlation between thinking & being & never to either term considered apart from another.” (AF 5) The objective & subjective states that are typically looked at together, where we are to never ‘know’ the thing in itself outside of this ‘inescapable’ relationship. So here we have the thorn Meillassoux wants to excise—the presumed finality of correlationalism & Meillassoux’s concepts that are decidedly ‘after’ correlationalism. The thing in itself traditionally lies unexposed & out of our thoughtful immediate grasp. For example, the now dubbed correlation can be loosely illustrated by Berkeley’s challenge to Locke’s primary & secondary qualities, where the primary quality is said to be out of total reach of the idealistic subject, but Berkeley did not doubt the realist/materialist position concerning the in itself & was as an idea, but nothing more is to found beyond that. The correlation can also be simplified as: the idea that our thoughts are never separated from the objects we encounter in everyday life & these objects are usually never regarded as ‘outside’ our apprehension hence, we are in an inescapable correlate with ourselves & the objects we encounter. We have been convinced that such an endeavor is an impossibility, primarily by ‘insurmountable’ thinkers like Kant. 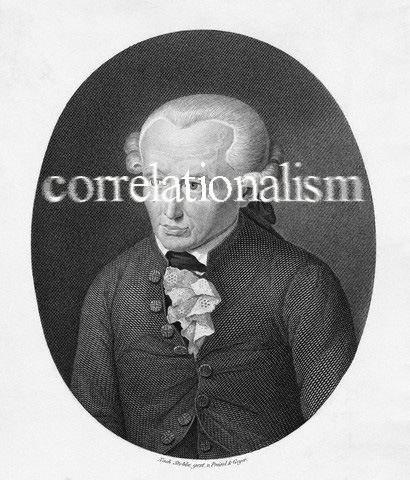 Kant is the 800 lb. correlational protagonist in this story. It is his idealism that is under scrutiny here. 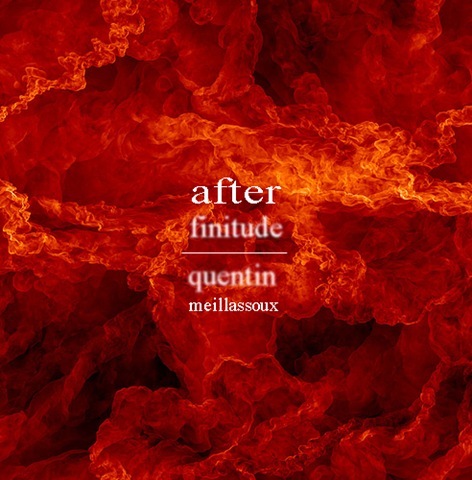 His correlation is said to be ‘weak’ (as Meillassoux writes about in a later chapter) because Kant adimits that the in itself can be thought of, but cannot be ‘known.’ This is one correlation Meillssoux wants to challenge, that is to not see the in itself as always ‘for us’ & we can see the in itself as ‘thoughtfully’ Kantian. 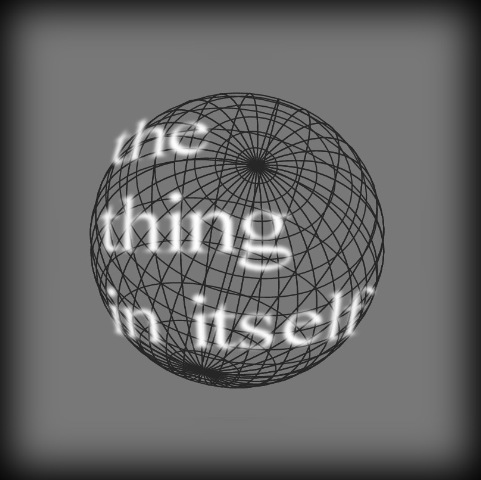 We’ll briefly remember Husserl’s phenomenology that had an in-depth emphasis on getting to ‘thing themselves’ via our conscious experience, without anything outside of that, still a valuable point of view, but a correlation nonetheless. This phenomenological perspective is named by Meillassoux as ‘strong’ correlationism, whereby the access to the in itself is out of the question & any queries into the thing it self are still just a ‘given,’ & intended by consciousness—the end. Analytic philosophy additionally falls into this category, whereby everything is assumed within the philosophy of language & logic with no room for remove, or at least with regard to our new terms—weak & strong correlationalism. If we haven’t felt the precarious, radical & controversial ground slipping yet, with another surprising ‘ancestral’ flourish Meillassoux carries in empirical science’s dates on the origin, accretion, origin of life & origin of mankind (billions & millions of years ago, respectively). His speculative examination emerges from this pre-history, prior, before & anterior to thought itself. 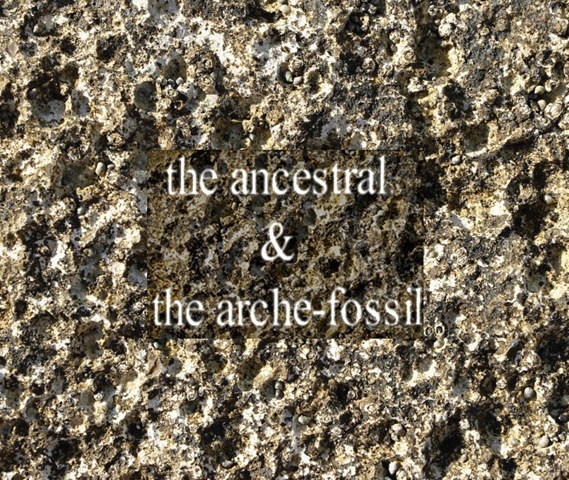 This is named the ‘ancestral.’ The material support for such an anterior ancestrality is named the ‘arche-fossil.’ According to Meillassoux we have the task of asking how might a correlationalist inquire into such ‘unknowable’ prehistory which empirical science has already dated & postulated. Metaphysical theories can easily account for such thoughts by claiming a god or god-like witness to account for the arche-fossil or the ancestral, but not for Meillassoux. Later on in the book Meillassoux will try to dislodge such ‘dogmatism’ from his own philosophical enforcements. We must emphasize that correlational philosophy is not always, in fact rarely, dependent on a metaphysics that can theorize & imagine the thing in itself as hand & hand with a necessary being, e.g. god & a necessary being could be ourselves too, a necessary being to think of the object. It too, is from a retro-active giveness that the correlationalist is said to have access to the the arche fossil & the ancestral. We see that science will have to accept such terms as scenarios & are particular ‘conceptions,’ that a scientific community has to verifiably accept (or reject). This has to be the acceptable manner whereby we conceive of these ancestral ‘manifestations.’ Meillassoux writes: “…from the perspective of correlationalism is the interpretation of the ancestral statements […] it is inadmissible—or at least inadmissible so long as it is interpreted literally.” (AF 13) Let us presume (as we’ve looked at) that science is more likely to adopt a ‘realist’ approach, in spite of the philosophical desire to ‘correct’ strict realist’s theory on the ancestral. …& following chapters are to be continued.